It’s true fall and your farmers market is abundant with fruit, particularly apples and pears. I have this love/hate relationship with pears that cannot be solved. When good, a pear is the best fruit possible. Of course, a pear is at its peak for all of 90 minutes it seems. Still, Suzen and I have been looking and we have some wonderful fall pear recipes to share with you. 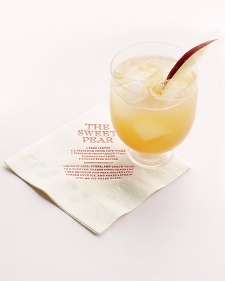 This is the first one, a pear cocktail from Martha Stewart. Now the recipe below is exactly what Martha says, and it uses pear nectar. The recipe is good, but there are alternative paths to explore. · Use a fresh pear, not nectar. Peel and slice the pear, then muddle it. To get a fluid [like nectar], and not just muddle mush, add some liquid like some simple syrup and the lemon juice. Then keep muddling away. When you shake your cocktail, really, really shake it. · Alternatively, after muddling, put the whole thing, including a few ice cubes and the booze, into a blender — or, much better, a Vitamix. You’ll get a “Pina Colada” style beverage that is cold, thick, and yummy. · Change the liquor from bourbon to something less intense. I’ve used gin, Suzen’s favorite. A low alcohol silver tequila would work. Dark, aged tequila may just have too much flavor power for those pears. Pear vodka? Don’t use the commercial versions. I’ll blog a much better homemade version this week. Muddle sage, sugar, and lemon juice in a cocktail shaker until fragrant. Add bourbon and pear nectar. Shake and strain into an ice-filled glass. Garnish with a pear slice.